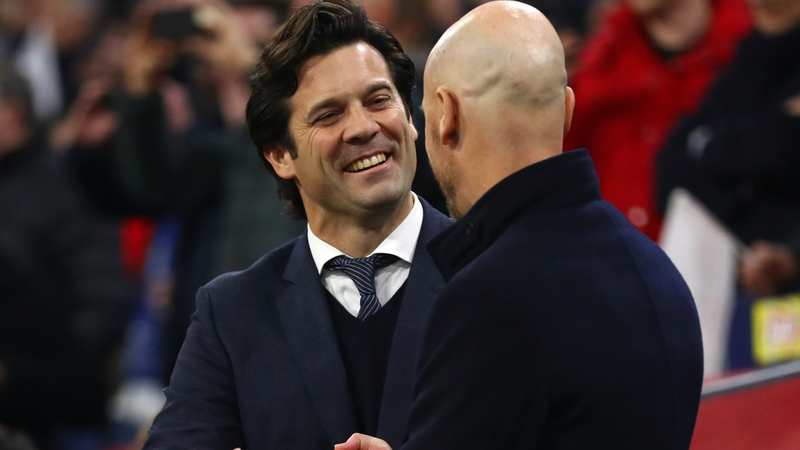 Santiago Solari said head coaches need to trust in VAR after Real Madrid benefited from a controversial call in Wednesday's 2-1 Champions League win at Ajax. Holders Madrid took control of their last-16 tie as goals from Karim Benzema and Marco Asensio, either side of a Hakim Ziyech strike, gave them a victory and two away goals at Johan Cruijff ArenA. Ajax thought they had taken a deserved first-half lead through Nicolas Tagliafico, but the goal was ruled out after a VAR review, with Dusan Tadic judged to have impeded goalkeeper Thibaut Courtois while in an offside position. Madrid boss Solari, though, insists officials should be entrusted to make such decisions as they are the only ones with access to the video replays. "We don't have the elements to make a judgement. We don't have a monitor. We trust what VAR or the referees say," he said. "Without a doubt [we suffered]. We knew how to play the game, how to work it, suffer through it and to score when we created those chances. "We did everything and that shows the strength of the players and of the group." Madrid struggled in the first half against Ajax's high press, but Solari did not agree that it was a poor performance overall. "That's your opinion," he said. "We had to do a lot of things to get this result. We had to work, suffer, know how to escape the press, and be strong. "This is the Champions League, the last 16, and there are no teams that are not very good. "They played with a lot of energy, pushing some situations to the limit, and they made us work hard for the win." Solari was pleased with Asensio's impact as a substitute, while he also denied he took off Gareth Bale after 61 minutes because of a poor display from the Wales forward. "I'm particularly happy with his goal and his performance," he said of Asensio. "He's played in three or four games since he came back from injury. "He did everything he had to do, not only for the goal but also how he acted on the pitch, how he defended and for his effectiveness in reaching the goal." When asked about Bale, he added: "I'm very happy with everyone's performance. It was a very difficult game and we needed the maximum from everyone. Without that, we wouldn't have won."